Join us in an incredible French wine tasting experience, guided by a knowledgeable and charismatic sommelier. During your evening with us, you will be drinking 6 wines, each from a different region in France. Each wine will be accompanied by and paired to French cheese and cold cuts. You will also receive a selection of bread, olive oil, nuts and Belgian chocolates. 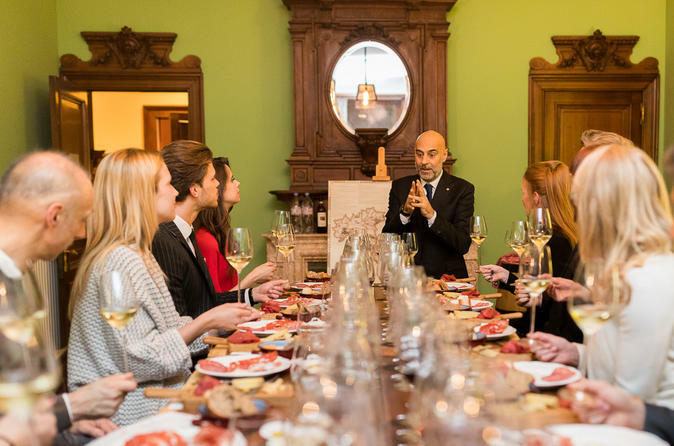 You will spend the evening learning a variety of things- from the right way to taste wine to the different regions and grape varieties that have made France the most famous wine producing region in the world. Spend your evening in our beautiful wine hall in the heart of Antwerp with a wine, cheese and charcuterie tasting. Led by an expert sommelier, you will be tasting six different French wines. Starting with Champagne, through three white wines and ending with two red wines, you will be experiencing the best of what France has to offer, learning about each region and the differences between them. Each wine will be paired to cheese and charcuterie, teaching you about the essence of pairing wine to food. You will get a chance to try French goat's cheese, Roquefort, Jambon de Bayonne from the South-West of France, as well as other French produce, each indigenous to it's own region. Finish the evening with the world-famous Belgian chocolate pralines, and go home with increased knowledge and new expertise in French wines. The length of the evening depends on you, ranging from two hours to four hours and more depending on the amount of wine you drink and things you would like to learn !